We left off on 4/19 with the "Big Dig". This was so fascinating to see. Next step was for the pool supervisor to come check things out. He measured the pool from every angle possible and decided that it was 3" too deep. That's inches folks, but it wouldn't do. You see, the plumbing guys would lay all the pipes at the depth specified on the plans and the rebar people would do the same and they would all be floating way up in the air. The city inspector wouldn't sign off on that, so back came the "dig" guys to fix it. 4/25 - They brought in a truck with some dirt and all the equipment again. the guy with the backhoe scooped it up and put it in the pool. and again. Finally it was decided it was perfect. Just as soon as these guys finished, the plumbers came rolling in with tons of pipes and fittings. They immediately started digging channels for their pipes. One guy took the plans and went around spraying orange dots everywhere one of the pop-ups for the In-floor Cleaning System and the drain were going to be. In no time at all they had pipes running all over the place. You can see all the pop-ups capped off all over the bottom of the pool and on the bench and steps. This is the main drain. Pipes hooked up to the skimmer and the pump. That's a lot of pipes. Next was to do a pressure test with the water turned on and see if we had any leaks. - - -- not a one, so we are good to go. 4/28 - Here comes the Rebar guy. This is a one man crew and he is fascinating to see. Each crew that has been here set up their radio first thing and turn on their music. So far they have all listened to a Spanish station. This guy is so fun to hear. He sings along with every song and he's not bad. It didn't take him long to haul all this steel around to the back yard and get busy. This is going really fast and he is measuring everything. They all have a set of plans and they check them constantly and measure everything exactly. Can you believe this? He has completely formed all this steel in the shape of the pool and ready for the shotcrete. That is kind of a cement/plaster kind of mix. 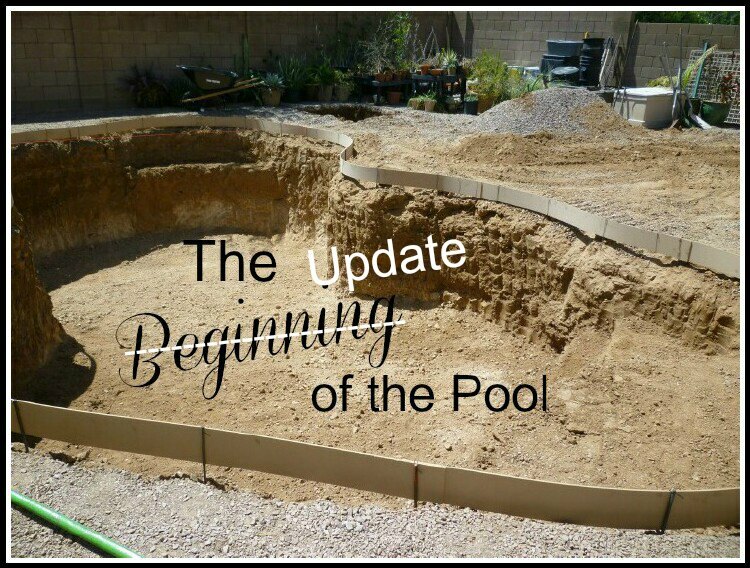 It goes on first and has to cure for quite a while, then the plaster "Pebble Sheen" goes on and they fill the pool immediately. Then the Electrical guys showed up. They are here to bring all the electrical from the front corner of the house to the pool pump and all the other equipment. The big electrical panel is going up on the black wall of the fence. The electrical panel is up and now they are going to hook up the light inside the pool. This guy has a propane torch and he is heating up the pipe and when it is really soft, the other guy fishes it through all the rebar and connects it to the pool light. All done, ready for the inspector and looking fabulous so far. Another crew came and put the block wall back up, so now I need to paint it and we need to get the yard guy here to help put this area back together. With all those trucks driving thru here, this is really a mess. We are looking good and the pool is coming along nicely. The inspector from the city is supposed to come on Monday. Won't be long now. This is fascinating!! I can't wait to see the finished pool! What an intricate process! It looks huge. I bet you don't get much done for watching all this fascinating progress. It's moving really fast! You will be swimming in no time. Excited to see it filled with water. This truly is an exciting process! I am so excited for you. Your family is just going to love it. So exciting!!! Fun to see the progress!! Truly pleased for you. You have mentioned the desire for a pool many times and it's nice to see it happening literally before your eyes. Also, I learned something about rebar from your post..I didn't know there were so many types of rebar. Actually thought all rebar was iron so I googled it. Your stainless steel rebar is the best according to the info I found. Now if only I can use my expanded knowledge of rebar during a board game with the family I will cite you as the first source. I haven't looked at Phoenix temps lately....you must be nice and warm or slightly toasty by now. How I missed warm temps this last nasty winter here in the PNW. Marty, it's exciting to see all the progress so far! I like all of your pictures showing how it's done. Can't wait to see the final result. Thanks for sharing things most of us didn't know. Things are really moving along at your new home. The pool must be the most exciting part (other than finding a house in your price range where you wanted to live). Funny about the music. When I had the roof replaced, I had to tell them no music because my neighbor works at night and sleeps during the day. Can't wait for the next update with you by the pool with something cool to drink. I'm enjoying reading about this and seeing the step by step pictures. It looks like you are going to have a first class setup and it's being done with great precision. You are going to love using it so much! I know how hot it is there so I can well imagine it will be actively used! Happy for you!! I bet you cannot wait to take that first dip in the pool!!! I have enjoyed the process of your pool. Feel like I am there in person. I know that you are so excited to go swimming. I can hardly wait to see the end results. I had no idea this is how a pool was built! thanks for sharing. As everyone has said, this is so interesting and fascinating to see! Thanks so much for posting all your photos of the process--it's a real education! Won't be long now! I didn't think that you just dug a hole and put water in but i had no idea that building (installing?) a pool was such a production. Thank you for the step by step, it's pretty fun to see. Marty, I am like you....taking pictures along the way, asking questions and documenting all the processes. Funny thing, just like your excavation of taking dirt out, and then having to haul dirt back in, that happened to us when we renovated our landscape (and it was quality river bottom soil that was hauled off!). You pool is going to be luxurious!